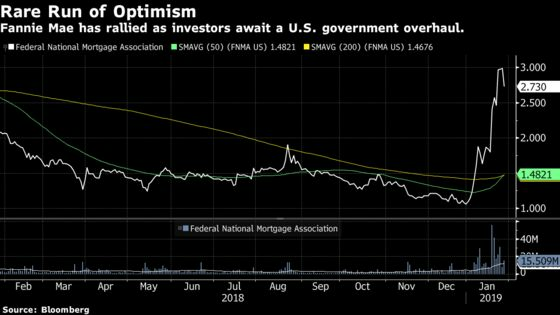 (Bloomberg) -- The Trump administration’s push to free Fannie Mae and Freddie Mac from federal control will likely start with the White House calling on federal agencies to put forth ideas for a legislative and regulatory overhaul of the housing-finance giants, said people familiar with the matter. Such an approach indicates the administration’s ambitions aren’t as sweeping or as far along as some investors hoped. And a White House spokeswoman confirmed Tuesday that they want to work with Congress, providing more evidence that changes might not be imminent. Controversial issues routinely move slowly on Capitol Hill, particularly during times of divided government. Fannie and Freddie both fell more than 22 percent Tuesday, the biggest daily declines since February 2017. The shares had been rallying this month after acting Federal Housing Finance Agency Director Joseph Otting reportedly said a proposal for freeing the companies would be released in the next two to four weeks, and that the FHFA and Treasury were willing to bypass lawmakers. Figuring out what to do with Fannie and Freddie, which the government took over during the 2008 financial crisis, has confounded policy makers for more than a decade.